iHeartMedia announced Thursday the debut of four original iHeartRadio podcasts during the 3rd annual IAB Podcast Upfront. The podcast platform has seen a 60 percent increase in listenership from iHeartRadio's more than 100 million registered users. The new podcasts include "The Oh My Disney Podcast," "The Fatherly Podcast," "Scrubbing In With Becca Tilley" and "Summit: Chairlift." iHR's current podcast platform features a directory of more than 8,500 podcasts across 19 different categories -- from business and finance to comedy and entertainment. Over the past year, iHM has partnered with content providers including NPR, PRX/Radiotopia, WNYC, All Things Comedy, audioBoom and Libsyn. The company has also launched several other original content and branded podcasts, including "Label Defiers," "The Ben and Ashley I. Almost Famous Podcast" and "The Thrive Global Podcast" hosted by Arianna Huffington. Also announced during the upfronts, iHeartMedia's nationally syndicated radio host Bobby Bones will bring his newly launched Nashville Podcast Network to iHeartRadio. The network will feature seven podcasts, giving listeners an inside look at the lifestyle and pop culture in Nashville and hosted by Bobby Bones. "By launching into podcasting, we're addressing a very real need for our active audience of millennial parents," said Fatherly CEO Mike Rothman. "Our goal, together with iHeartMedia, is to create content that not only educates, but entertains. The perception of fatherhood is in a constant state of evolution and spreading our message to a new audience of dads and moms offers an invaluable service." "In an age where visual distractions are everywhere, the power of sound is what captivates," commented iHeartMedia Senior VP/Podcasting Chris Peterson. 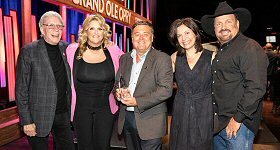 "As the leader in everything sound, iHeartMedia continues to produce entertaining and engaging original content for our hundreds of millions of listeners across broadcast and digital. With access to top-notch personalities, artists, leaders and brands, we are positioned to take podcast listening to a whole new set of ears."